Jan's Writing Journal: ICY OLD CHESTER!.......DECEMBER 1963. 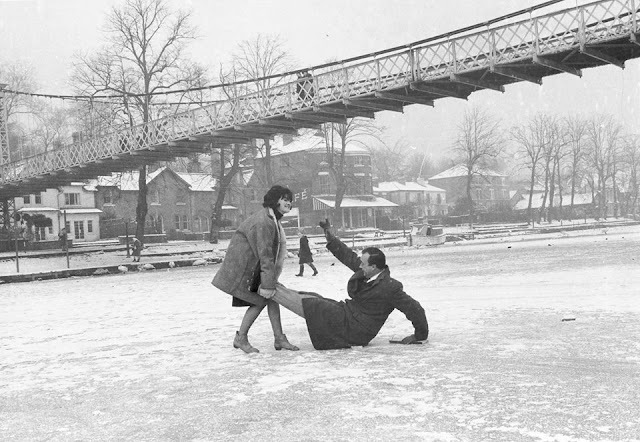 WHEN the Dee at Chester was completely frozen...in the coldest winter since 1947....And HA! same winter my very first boyfriend "treated" me ( after school...in school uniform too...WOT a crime!) to fish and chips in Hignett's, Frodsham St.......superlative Chippy indeed!! Never mind the Chester Grosvenor..!
" BELL.... BRANAGH.... THIS WEEK...."
" Didn't My Mother Wear Chiffon....?"